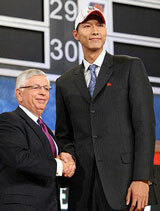 Chinese basketball star Yi Jianlian was selected with the 6th pick in the 2007 NBA draft by the Milwaukee Bucks. The 19-year-old power forward will become the 4th Chinese player in NBA after Wang Zhizhi, Menk Bateer and Houston Rockets star centre Yao Ming. Yi is 6ft 11in. He previously played for Guangdong Southern Tigers in the Chinese Basketball Association and has played with the Chinese national team in the 2004 Olympic Games and 2006 World Championships. Yi is surprised with Milwaukee’s decision to pick him, as he has previously expressed his desire to play in a city with heavy Asian influence. Milwaukee, with an estimated 27,500 Asian-American population, certainly doesn’t fit the bill. Newer PostAkihabara Liberation Demo – otaku freedom!! !